The March Madness action is rapidly coming to a close here in the 2019 NCAA Tournament, with the Final Four giving us our final two national title contenders. Monday night in Minneapolis, both Texas Tech and Virginia punched their tickets to the title game, and soon we will be crowning a new national champion in college basketball. Below, you will find all the basics -- the bracket itself, how to play our Bracket Games -- as well as expert picks and analysis for every regional in the field and so much more. CBS Sports will be with you from now through the national championship on Monday, April 8, so stay tuned for full coverage of the 2019 NCAA Tournament. CBS Sports covered Selection Sunday from start to finish. If you wish to view our updates from the big day, keep on reading or click here if the application does not load properly. So who wins Auburn vs. Virginia? And which side of the spread can you bank on in over 50 percent of simulations? 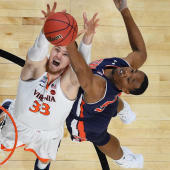 Visit SportsLine now to see which side of the Auburn vs. Virginia spread to jump on, all from the advanced model that is up more than $4,000 on its college basketball picks, and find out.